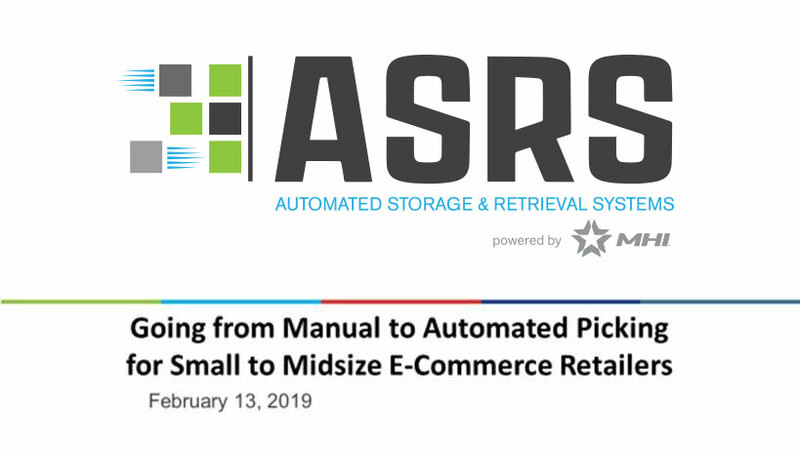 Automated Storage/Retrieval Systems (ASRS) members are the Industry’s leading suppliers of automated storage/retrieval systems. They supply systems worldwide and in virtually every major manufacturing and distribution sector. Mission: Deliver member value by collectively and collaboratively growing and supporting the Automated Storage/Retrieval Systems market. Vision: To be recognized as the independent authority on Automated Storage/Retrieval System solutions and technologies. Delivery of market intelligence through the collection of statistics and other activities. Preparation and distribution of promotional and educational materials on key features, advantages and benefits of AS/RS for customers. Developing safe-harbor relationships through networking and collaboration. 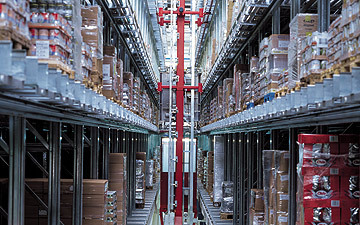 An Automated Storage and Retrieval System (AS/RS) is a combination of equipment and controls that handle, store and retrieve materials as needed with precision, accuracy and speed under a defined degree of automation. 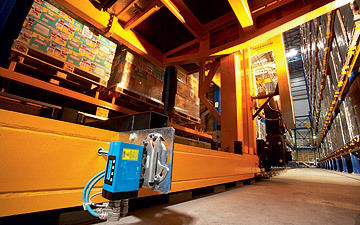 Systems vary from relatively simple, manually controlled order-picking machines operating in small storage structures to extremely large, computer-controlled storage/retrieval systems totally integrated into a manufacturing and distribution process. Generically speaking, AS/RS refers to a variety of computer-controlled methods for automatically depositing and retrieving loads to and from defined storage locations. 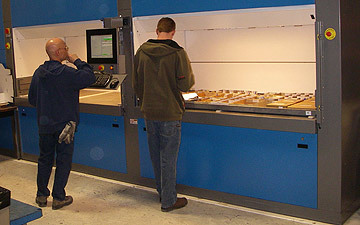 Within an AS/RS environment one would find one or more of the following technologies: Horizontal Carousels, Vertical Carousels, Vertical Lift Modules, and/or Fixed Aisle (F/A) Storage and Retrieval Systems, the latter utilizing special storage retrieval machines to do the work needed to insert, extract and deliver loads to designated input/output locations within the aisles being served. The right application of AS/RS provides a long list of user benefits! 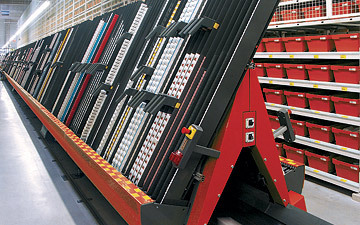 It has been demonstrated time and time again that Automated Storage and Retrieval Systems are proven technologies capable of effectively and reliably handling and buffering raw materials, work-in-process inventories and finished goods of all kinds, making it possible to totally integrate material handling storage, however temporary, into the total process being served. The collection and dissemination of reliable industry statistics. 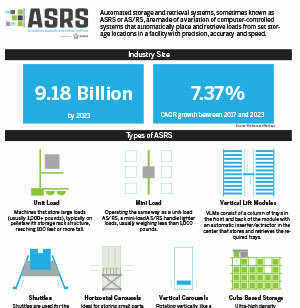 AS/RS has two Working groups: Fixed Aisle (F/A) and Carousel/Vertical Lift Modules (C/VLM). Click here to view our members. B30.13 applies to storage/retrieval (S/R) machines and associated equipment, such as aisle transfer cars and aisle equipment, and interfaces with other material handling equipment covered under other standards. The provisions of this Standard applying to S/R machines shall apply equally to the construction, installation, inspection, testing, maintenance, and operation of aisle transfer cars and any load handling equipment which is part of or attached to S/R machines or aisle transfer cars. This standard serves to eliminate or minimize the hazards which can arise during installation, start up, operation, maintenance, testing, and dismantling of power-operated vertical carousels and vertical lift modules. 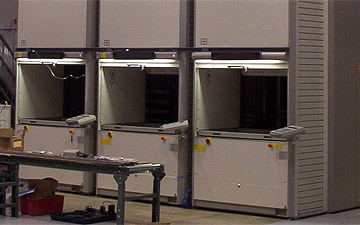 Vertical carousels are circulating storage equipment modules with load carriers that can be provided with one or more access openings. Vertical lift modules handle goods such as storage containers placed on load carriers using a built-in lift unit that carry goods from an access opening to storage locations in a racking tower, or from a storage location to an access opening. The documents below can be used in conjunction with our usage requirements. Automated storage and retrieval systems (ASRS) enable warehouse operations to be efficient and productive while reducing operating costs. See how an automated storage solution can be the most effective method of buffering, sequencing and storing inventory in your operation. Now that you've made the decision to implement an AS/RS at your organization, your job isn't over. You have to justify, influence and win over stakeholders for a successful AS/RS implementation. This presentation will help you understand how to justify the project to finance, gain support of warehouse labor and sell senior management to ensure success. To download the file you must agree to the following terms. The Automated Storage/Retrieval Systems (AS/RS) Product Section is the author and owner of this original publication. The publication contains material wholly original with AS/RS and is copyrighted subject matter under the laws of the United States and other countries. AS/RS owns a copyright in the publication as well as the content original to it. The publication, both in its entirety and in relevant portions, is hereinafter called this publication. AS/RS has made this publication available on this web site to promote and encourage the wide distribution and dissemination of this very important document. Like any copyrighted material, however, certain restrictions do apply to its use. Users of this web site should be aware that duplication of copyrighted material by individuals, or within all kinds of institutions, requires permission of the copyright owner. Accordingly, you must agree to the following terms before accessing or duplicating this publication. Any use of this publication by User after this notice shall be deemed to constitute acceptance by User of this agreement. Please note: Any unauthorized duplication of this publication will be treated as copyright infringement. Additional copies of this publication may be ordered from the Material Handling Institute. Changing Information: Information in this publication may contain technical inaccuracies or typographical errors. this publication and the information therein may be changed or updated without notice at any time. Copyright: AS/RS owns a copyright in this publication. this publication is protected by the United States copyright laws and international treaty provisions. Therefore, the User must treat the this publication like any other copyrighted material except that the User may print one hardcopy or make one transfer to another electronic medium of this publication from this web site pursuant to the terms of this Agreement. Other Restrictions: The User may not publish, retransmit, redistribute, rent, lease, sell, distribute, or otherwise transfer all or any portion of this publication. The User may not create any derivative work or any collective work using any portion of this publication. The User may not display this publication publicly. The User may not alter this publication in any way. No Warranties:THIS PUBLICATION AND THE INFORMATION CONTAINED THEREIN IS PROVIDED "AS IS", WITHOUT WARRANTY OF ANY KIND, EITHER EXPRESS OR IMPLIED, INCLUDING BUT NOT LIMITED TO THE IMPLIED WARRANTIES OF MERCHANTABILITY, FITNESS FOR A PARTICULAR PURPOSE, OR NON-INFRINGEMENT. SOME JURISDICTIONS DO NOT ALLOW THE EXCLUSION OF IMPLIED WARRANTIES, SO THE ABOVE EXCLUSION MAY NOT APPLY TO YOU. No Liability: In no event will AS/RS be liable to any party for any direct, indirect, punitive, special or other consequential damages for any use of this publication, including, without limitation, any lost profits, business interruption, loss of programs or other data. Indemnification: User agrees to defend, indemnify and hold harmless AS/RS, its affiliates and their respective directors, officers, employees and agents from and against all claims and expenses, including attorneys' fees, arising out of the use of this publication. Trademark and Copyright Notices: This publication contains copyrighted material and trademarks. In the event of any permitted copying or use of this publication, no changes in or deletion of trademark legend or copyright notice may be made. This Agreement grants no rights to use the trademarks used in this publication. Governing Law: This Agreement is governed by the laws of the Commonwealth of Pennsylvania and the United States of America. By downloading and using this publication, the User agrees to be bound by the terms of the foregoing Agreement.